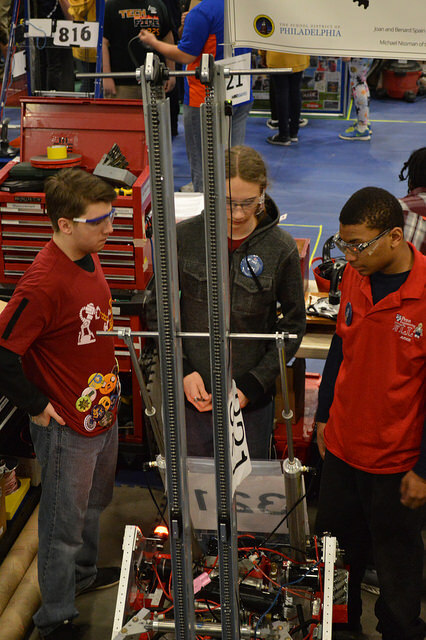 On March 13 to March 14th, the Robolancers competed at Springside Chestnut Hill Academy. The unique thing about this year’s game was that the human players could slide silver totes (boxes used in the game) through a chute for the robots to grab. Stacking these silver totes into a specific white zone gave teams point. There is also a green recycling trash can that could be placed on top for even more bonus points. Robots can obtain totes and recycling trash cans through the huge assortment of silver totes near the center of the field. Furthermore, the gold totes, if stacked in the center by both sides, would grant “coopertition” (cooperation + competition) points to both sides. The most unique thing, though, was the fact that human players could toss “litter” (pool noodles) over the wall of the field, as if they were gold Olympic medalist javelin throwers, into the opposing side for extra points. Overall, the robot designs at the event were impressive. For example, Techfire, team 225, had a robot that allowed it to create two sets of two-stack tall totes (the boxes) at once. MOE, team 365, had a robot that resembled a forklift truck. Our team, team 321, had a series of hooks on a belt that rotated. This allowed our robot to snag on several totes at once. However, we did encounter several issues, including parts falling off during matches. Despite all of these setbacks, we still ended up becoming the 8th seeding captain for the event, which meant we would be going to the semi-finals. We were paired with team 484, Roboforce, and team 3637, The Daleks. With their help, we landed in 2nd place by the end of the quarters-finals matches. By the time we reached the end of the semi-finals, we ended up in 4th place, which was a great accomplishment for the entire team. Additionally, we also won a creativity award for our hook design, and for our extensive use of sensors. As one Robolancer member generously commented, we had a “bucket of sensors”.